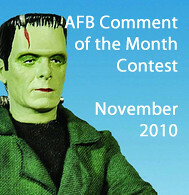 The AFB Comment of the Month Contest - November 2010! First off, thanks to everyone who commented on last month’s blog posts. It was my birthday month, and in the spirit of giving there were two prizes on offer! Congratulations to blog commenter Super-Duper ToyBox and AFB Facebook fan Olivier Fritsch for being our randomly selected winners! Gentlemen - you can contact me through Facebook or the AFB Forum (Personal Message to "Andy"). 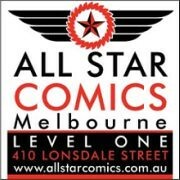 Once we hear from our winners, their choices of either the Ted Knight or Jack Knight Starman figures from DC Universe Classics Wave 15 will be on the way when available from Mike’s Comics N’ Stuff. 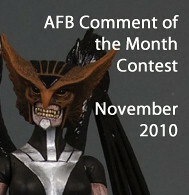 Now to November’s Contest: on offer are two great prizes, either the Universal Monsters Retro Series 1 Frankenstein figure or Black Lantern Hawkgirl figure from DC Direct's Blackest Night Wave 6. These would have been great figures for the Halloween month, but since I couldn't find any turkey action figures for Thanksgiving, they'll do for November! .....and your little Monkey too! Marvel Universe Wave 10 is in!